Drafts from Around the World: 9/26: Czech please! 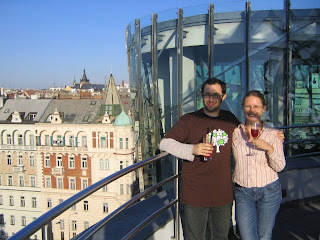 For our last day in Prague, we started off with a farewell lunch at our U Medvidku hotel/brewery. Enjoyed small glasses of the house-made Oldgott barique (half dark beer) with pork neck and bread dumplings - yum! Olga is really getting into the Czech spirit of things, taking one for the beer tasting team. Finally made it out of the (very) touristy areas and started walking around greater Prague. 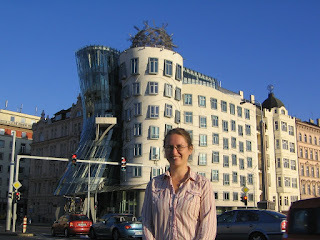 Meandered over to Frank Gehry's Tančící dům (Dancing House). Being fans of Gehry's work, we were sad to see a big sign saying the building is private and there is no public entrance. But low and behold, around the corner is another sign saying you can have free entrance to the roof if you buy the "cocktail of the day" at Celeste Bar. Well, you don't have to tell me twice! 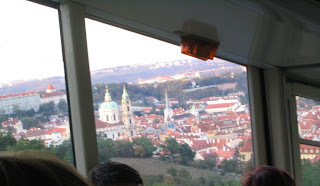 The view from the top is magnificent - you can see to the ends of the earth from up there, it is an indescribably beautiful view of Prague. You'll just have to go see it for yourself! From there, we crossed over to the Little Quarter to ride the funicular up to the top of the mountain. We were in a bit of a crunch, but we had just enough time to smell the roses (literally) in the mountaintop rose garden. There is something special about those aging Soviet Bloc funiculars - the cars and station interior design seem to be identical to the funicular in Kiev -- somebody should do a full dissertation on this. 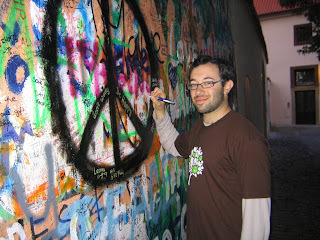 Back on the ground, we managed to find the John Lennon wall, which Prague residents had been lovingly graffitiing since the 1980s as a peaceful protest of the politics du jour. 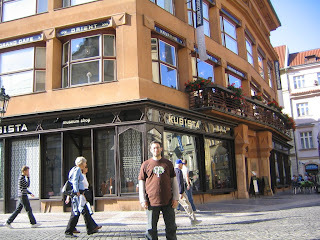 Then we headed on hear the Praga Sinfonietta playing Czech classical/romantic music by Smetana and Dvořák. 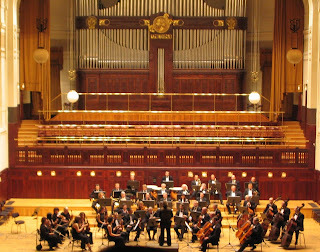 It seems that when the Czech Philharmonic and the Prague Symfonicky are on break, they have a mini-Symphony that fills in. It was nice to hear the native Czech music in this grand setting (Prague Municipal House), and conducted by one of the few women conductors. After dinner of Slovakian food -- veal cutlet and potato pancakes filled with ham -- headed back the U Medvidku hotel/brewery one last time for a final-final farewell and one last of the X33 strongest beer in the world. Tried to order the beer float, but the kitchen had just closed. Better luck next time! Picked up our bags and headed towards the train station. go back and try the beer float!!! 9/21 and 9/22: Viva la Poland! Bye San Francisco, Hello Warsaw!